We are pleased to announce the winners of the 2017 Long Path Race Series! The Long Path is a 358-mile hiking trail that reaches from New York City to the outskirts of Albany, along the way traversing some of New York’s most beautiful parks and preserves, including the New Jersey Palisades, Harriman State Park, Schunemunk Mountain, the Shawangunks, the Catskills, the Schoharie Valley, and the Helderberg Escarpment. Created and maintained by the New York-New Jersey Trail Conference, the Long Path is a labor of love for some 250 volunteers. Henry David Thoreau, transcendentalist philosopher and author of Walden, wrote an essay on the colors of fall foliage. But what about the colors of winter? With this question in mind, I set the alarm for 5:30 AM and went to bed early. Tomorrow’s agenda would be to climb four of the Catskill high peaks with the goal of making progress toward the Catskill 3500 Club winter patch, as well as the Grid. And perhaps I’d see or learn something along the way that would help me better appreciate the winter mountain landscape. John Burroughs once wrote that to be an observer is to “find what you are not looking for.” With this thought in mind, I set off for a trail run in Minnewaska State Park Preserve a couple of weekends ago, with no particular goal but to cover some ground and open my eyes. Perhaps I’d observe something that I wouldn’t have even thought of looking for. As flowers start to fade and leaves begin to fall my thoughts often turn to lichens, mosses and all of the other beautiful things you can still find in nature in the winter. We’ve had two or three days of drizzle; nothing drought busting but enough to perk up the lichens. Lichens like plenty of moisture, and when it doesn’t rain they will simply dry up and wait. 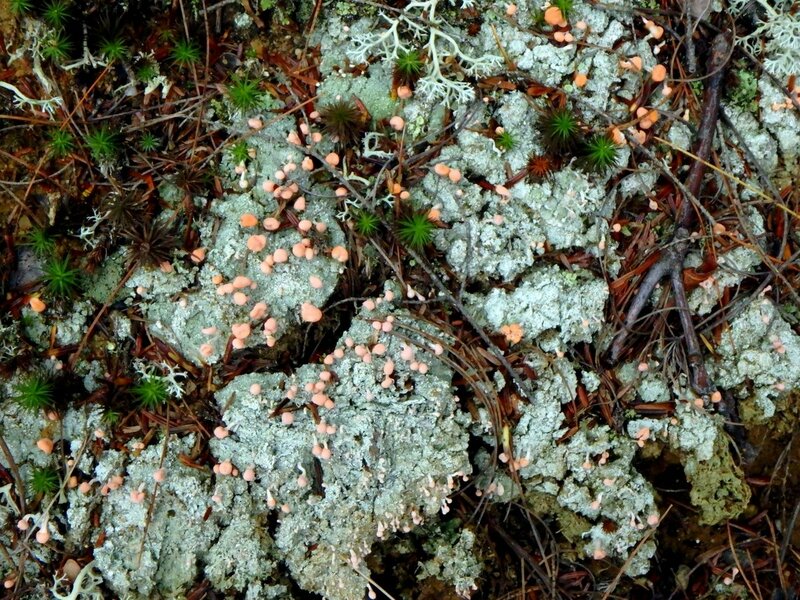 Many change color and shape when they dry out and this can cause problems with identification, so serious lichen hunters wait until after a soaking rain to find them. This is when they show their true color and form. 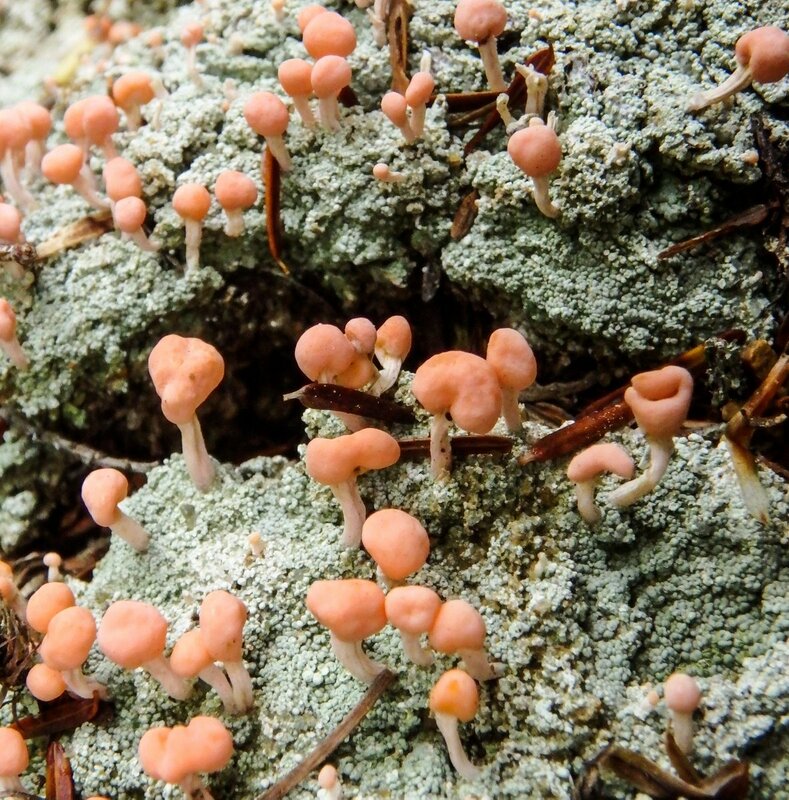 The pink fruiting bodies of the pink earth lichen in the above photo for example, might have been shriveled and pale before the rain.